Dorinda Medley Wants Lady Gaga’s Mom to Join The Real Housewives of New YorkAnd a few other things we learned from Andy Cohen’s Real Housewives panel at the Tribeca TV Festival. The Real Housewives of New York City Reunion Recap, Part Three: Wonderful PooCarole has a rough night in the final, season-capping reunion special. The Real Housewives of New York City Reunion Part 2 Recap: Behind Frenemy LinesFights break out and drinking problems get discussed and denied as the season 10 reunion continues. The Real Housewives of New York City Reunion Part One Recap: Original SinThe first of three reunion specials features amazing fashions but can’t hide what a problem Bethenny has become. The Real Housewives of New York City Recap: Let’s Talk About Poop, BabyThis show has not a modicum of decorum left, and I couldn’t be happier about it. 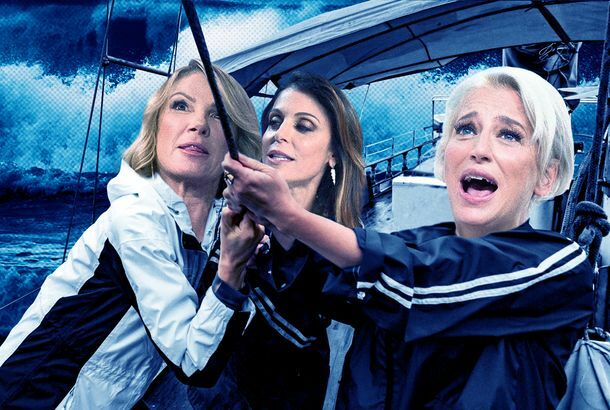 The Real Housewives of New York City Recap: Boat Ride From HellStill squabbling, the Housewives take a boat. The boat hits a storm. It’s chaos! The Real Housewives of New York City Recap: Margarita MadnessThe Housewives dine, drink, and fight then drink and fight some more. The Real Housewives of New York City Recap: They Be Trippin’The Housewives go to Colombia where Bethenny makes a terrible mistake in her choice of soup. An Evening With Luann de Lesseps, the Countess of Reality TVAt Luann de Lesseps’s cabaret show, everyone feels like part of the extended Real Housewives universe. The Real Housewives of New York City Recap: The Dating LameA cabaret legend makes an appearance and the Housewives have an eventful evening speed dating. Real Housewives of New York City Recap: Down for the CountessThe visit to the Mayflower continues, and so do the arguments. The Real Housewives of New York City Recap: Mayflower PowerA trip to Connecticut’s Mayflower Inn leads to some jockeying over who gets the best room and jail stories. The Real Housewives of New York City Recap: Good GriefThe housewives say goodbye to a truly decent-seeming man on an unusually somber episode. The Real Housewives of New York City Recap: Gun Club Road GirlsBethenny gets beaten at her own game. The Real Housewives of New York City Recap: Nutcracker SuiteFights and more blood than usual. The Real Housewives of New York City Recap: Kill Me DeadThe most boring hour of reality television ever recorded. The Real Housewives of New York City Recap: Life, Cabarets, Old FriendsWhat starts as a genuinely heartwarming episode takes a nosedive pretty quickly. The Real Housewives of New York City Recap: That’s a Relief EffortBethenny helps the Puerto Rico relief effort, and I would rather watch months of this than see one more Skinny Girl logo on television ever again. The Real Housewives of New York City Recap: Bendel Like BeckhamSonja is really, really bad at expressing herself. The Real Housewives of New York City Recap: ‘Til Death Do Us PartyRamona’s dinner party is the ne plus ultra of Real Housewives events. The Real Housewives of New York City Recap: Thx for NothingI will never not be amused by Sonja Tremont Morgan. The Real Housewives of New York City Recap: The Age of AquariaSonja has really taken it too far this time. The Real Housewives of New York City Recap: Diana LossThis is going to be one hell of a season. The Real Housewives Give (Fake) Depositions About Their Boat Ride From Hell We got ahold of the cast’s depositions in this lawsuit, before they even happened. Witness Sarah Paulson’s Joy at Being Surprised by Real Housewife Dorinda MedleyPaulson is a Dorinda superfan. A Very Special RHONY Recap: Luann’s Dramatic Sit-down With Andy CohenRHONY’s Luann de Lessep finally talks about her divorce. RHONY Reunion Recap: That’s What Friends Are FlooredFor the first time ever, the Housewives actually enjoy each other’s company. The Real Housewives of New York City Reunion Recap: Lower East SnideRemember when Bethenny was a lovable underdog? The Real Housewives of New York City Reunion Recap: Fairy Tale DreamLuann’s divorce has pushed reality TV to a new level of meta. RHONY Season-Finale Recap: Divorce, New York StyleI’m sorry about this, but we need to talk about Tom. The Real Housewives of New York City Recap: Hook, Line, and StinkerSonja Morgan is living her very best life. The Real Housewives of New York City Recap: Patrón SaintsI haven’t liked Bethenny this much in a while. The Real Housewives of New York City Recap: Oh No, MexicoLuann falls down drunk twice in this episode. The Real Housewives of New York City Recap: I’m With StupidLuann’s collection of statement necklaces is incredible. The Real Housewives of New York City: The Slopes TrialFor the first time in a long time, all of the Housewives seem to be enjoying each other. The Real Housewives of New York City Recap: VermonstersThe Housewives just need to chill the hell out. The Real Housewives of New York City Recap: They Snooze, We LoseThe most boring episode of any Real Housewives franchise ever. The Real Housewives of New York City Recap: Tying the NotLuann’s wedding is a completely absurd comedy of errors. The Real Housewives of New York City Recap: Where There’s a Jill, There’s a WayJill Zarin is back and she does not disappoint. The Real Housewives of New York City Recap: Pre-Wedding CrittersThis episode finally shows us the Bethenny Frankel of old.